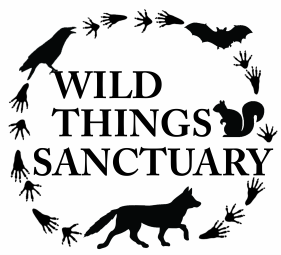 Wild Things Sanctuary is one of the only rehabilitation centers in upstate New York to rehabilitate bats. We love them! Many people have asked us about bat houses. Bat houses have become especially important in recent years as many roosting places in caves have become infected with White Nose Syndrome. Bats who commonly use bat houses in the NE are the Big brown bat (Eptesicus fuscus) (like the female bat pictured above) and the Little brown bat (Myotis lucifugus). 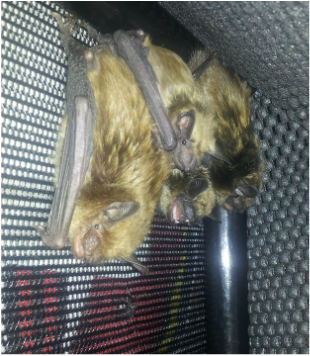 Give the bats a home and have the benefit of having free mosquito control! Did you know that in different geographic temperature zones bat houses should be different colors to either warm them up or keep them cool? A mother Big Brown Bat, her twin baby boys (to the right), and adopted female baby (on her back) find a safe place at Wild Things Sanctuary. The placement of your bat house plays a major role in the internal temperature. Houses can be attached to structures such as poles, sides of buildings and tall trees without obstructions. The area under and in front of the bat house should be clear, allowing the bats to fly in and out. There should be at least 20 feet of open space around the bat house. Houses placed on poles and structures tend to become occupied quicker than houses placed on trees. Your bat house should be mounted at least 15 feet above the ground, the higher the house the greater the chance of attracting bats. Bat houses should face south to southeast to take advantage of the morning sun. In northern states and Canada, bat houses need to receive at least 6 to 8 hours of direct sunlight. It is also advantageous to paint the house black to absorb plenty of heat. Baby bats require a very warm temperature. Paint only the outside of your bat house and use a non-toxic, latex paint. A baby bat climbing back inside her bat house to find her mother after falling into the "pup catcher". From Bat World Sanctuary. Tuttle, Merlin D., Hensley, Donna (1993). "Bat Houses: The Secrets of Success." Bats 11 (1). For more information on identifying bats check out "Stokes Beginners Guide to Bat Identification."